A new online map lets Seattle residents zoom in on the range of natural hazards that threaten their homes, hangouts and workplaces. Seattle is graced with spectacular scenery, but that beauty comes at a price. The natural forces that forged mountains, carved Puget Sound and nurtured some of the world’s lushest forests also expose the region to a jackpot of natural disasters. Government agency shelves — both real and virtual — are crammed with reports on vulnerabilities, high-risk zones and response plans. But it’s not easy to sort though the jargon and figure out what it means for your home, neighborhood or workplace. A new online tool developed by Seattle’s Office of Emergency Management aims to help bridge that gap with searchable maps that can zero in on risks at any point around the city. If you want to know whether your office or apartment building sits on soil that will turn to goo in a major earthquake, just click on the “liquefaction” tab and zoom. Other overlays show areas vulnerable to flooding, landslides and quake-triggered tsunamis. For earthquakes, the Seattle Natural Hazard Explorer relies on U.S. Geological Survey (USGS) modeling of how the earth will shake in different parts of town based on the underlying geology. Capitol Hill is expected to rattle more than Lake City, for example. Neighborhoods like Interbay, SoDo and Harbor Island will be pummeled the hardest. The project is an indirect spinoff from this summer’s gripping New Yorker article, “The Really Big One,” said Matt Auflick, outreach coordinator for emergency management. The story didn’t mince words in describing the impact on the Pacific Northwest of a Cascadia Subduction Zone megaquake and tsunami, and sent worried Seattleites flocking to public-information sessions and home retrofit classes. At those events, Auflick brought along maps from the 300-page Seattle Hazard Identification and Vulnerability Analysis, and found that participants gravitated toward them. 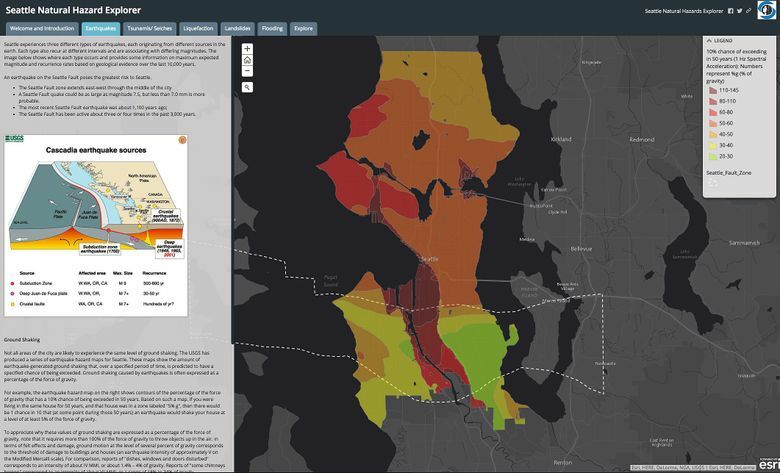 The Seattle Natural Hazards Explorer is designed to eliminate the need to wade through hundreds of pages by presenting the information in an easy-to-understand and graphic way. “The idea is to take the information and make it more accessible — and hopefully get people thinking about preparedness as well,” Auflick said. And for those who plan to relocate their households or businesses in the future, the hazard maps can add another dimension of data to consider. Rents might be lower near Pioneer Square, but the soil is prone to liquefaction in many places and the neighborhood has a high concentration of old buildings that aren’t likely to stand up to a major quake, Holdeman pointed out. Waterfront bluffs offer sweeping views, but a high risk of landslides. The new tool is a way citizens can inform themselves, but it’s still a work in progress, Auflick said. Some of the information is so technical it’s hard to simplify. The USGS earthquake maps, for example, illustrate the level of ground-shaking that has a 10 percent chance of occurring in the next 50 years, expressed as a fraction of the force of gravity. The city hopes to keep building on the tool, Auflick said. Information on bridges, roads and other infrastructure likely to be damaged in a quake could be added, as could data on neighborhoods with large numbers of elders and other vulnerable groups.